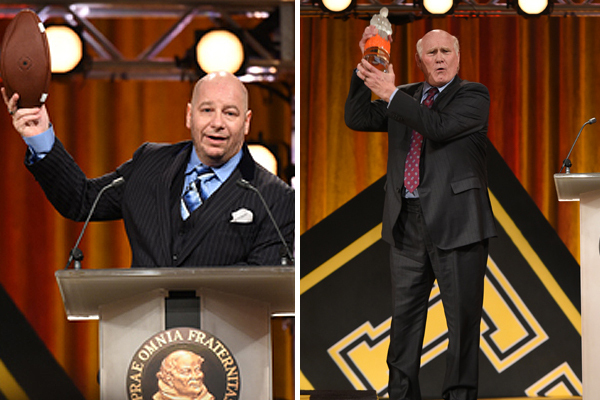 In early 2015, the Friars Club roasted legendary NFL quarterback Terry Bradshaw. Talk Soup's Joel McHale brought in the laughs as the Roastmaster, and many took the stage to poke fun, including: Jeff Ross, Lisa Lampenelli, Rob Riggle, Frank Caliendo, Matthew McConaughey, and more. The event was filmed at the Arizona Biltmore Hotel in Phoenix, Arizona and broadcasted on ESPN2 on Friday, January 30. Mike was one of the event's writers, and helped organize the entire lineup of jokes for all roasters. In October, 2014, the Friars Club honored legendary actor Robert De Niro with a lifetime tribute award at the Waldorf Astoria. Presenters included Harvey Keitel, Edward Norton, Christopher Walken, Penny Marshall, Orlando Bloom, and more! Mike was one of four primary writers of the program, and also assisted with other components of the production. And while he certainly enjoyed writing material for SNL's Keenan Thompson (which Variety dubbed as one of funniest moments of the night! ), his biggest honor was helping to select the montage of outtakes from "Awakenings" between Robin Williams and Robert De Niro that played in front of the 2,000 member audience. Oh, and hanging out with Harvey Keitel for two hours talking about Taxi Driver and Pulp Fiction? Just the icing on the cake. ﻿Check out more about the even﻿t here! The Friars Club invited Mike to return for the 2014 roast of former NFL superstar Boomer Esiason. The dais was packed with NFL icons and celebrity comedians alike; players/coaches like Dan Marino, Bill Cowher and Maurice Jones-Drew joined Jeff Ross, Carrie Keagan, Reese Waters and more. The event was hosted by Roastmaster Jeff Garlin ("The Goldbergs", "Curb Your Enthusiasm"), and surprise roaster New Jersey Governor Chris Christie! Nearly 2,000 people attended the event at the Waldorf Astoria, and Mike was officially credited as one of the event's ten writers. Of the event, Mike said that his favorite part was the honor of sitting at the writers' table with some of the finest comedic writers of his generation. In February of 2013, Mike's friend and partner Amadeo Fusca entered the Friars Club's "So You Think You Can Roast" contest along with 55 other contestants. As his head writer, Mike helped craft a two-minute roast, skewering the celebrity of their choice (Owen Wilson). The first-round audition process narrowed the field to 12 semi-finalists. As a semi-finalist, Amadeo participated in a live event roasting former 80s child star Ricky Schroder. Mike and Amadeo teamed up again, and Amadeo's great material, combined with a show-stealing impersonation of judge Gilbert Gotfried, helped land him a spot in the finals, roasting former NBA superstar Dennis Rodman. From there, Amadeo walked away as the sole champion, earning him the opportunity to roast Actor/Comedian Jack Black alongside comic heavyweights Jeff Ross, Amy Schumer, Sarah Silverman, Bob Saget and others. An Entertainment Weekly story was published which included the top 15 jokes of the night. Mike and Amadeo's jokes were included among them. Mike and Amadeo were also featured on WDVE, the Pittsburgh Tribune Review, and Pittsburgh Post Gazette.